Naif, the Deira neighbourhood, is a place that gets a bad rap for being too busy, too messy and too out of the way. Other than those who call it home, many residents and visitors avoid it — and probably would not walk through its narrow alleyways for four hours during Ramadan. So the success of Gulf Photo Plus’ Ramadan collaboration with tour company Frying Pan Adventures — a photo walk culminating in an iftar — could come as a bit of a surprise. At the time of writing, four out of six #UnseenTrail tours were sold out, with only 11 spots available on the remaining two days. Frying Pan Adventures founder Arva Ahmad, who has lived in Dubai all her life, says she only held three tours last Ramadan and had to increase to six due to the high demand. As someone who used to live in Naif but was wary of its many nooks and crannies, I was excited at the prospect of seeing it in a new light and with a focus on the history and traditions that set it apart from the rest of Dubai. For the newbies, Deira was where Dubai as we know it grew from. It was the city’s commercial centre due to its proximity to the coast and is home to museums, traditional markets and a multitude of mosques. The tour kicks off at 5.30pm from the Al Ras Metro station and soon my group and I are scuttling into the heart of Naif, armed with in-ear trail guides and cloth bags filled with guides, wet wipes and a small fan — it’s going to get sweaty. As we venture down winding streets, we reach a road with a mosque on either side and long lines already forming outside their doors. What these men are queuing for is the free iftar that will be served at approximately 7.10pm. That’s a long wait, but it’s worth it, guessing by the aromas emanating from the mosques. We pick up the pace and walk through tiny alleys that can barely fit a bicycle. We soon find a secret courtyard full of lounging men, a museum dedicated to a poet, a market lined with shops selling plastic toys, fried snacks, gold jewellery and more. It’s a sensory explosion that can only be experienced in Deira. One of the tour’s aims is to showcase a side of Ramadan that one might only see in this old part of the city. It’s where some of the largest amounts of iftar meals are served – almost 3,000 per day – for free and for anyone, regardless of religious affiliation. All you have to do is find a spot on the plastic mats on the floor and wait for the call to prayer, which is what our group did. Sat among hundreds of devotees, it was a unifying and humbling experience — like nothing I had ever felt before. Without giving away too much, prepare for some amazing Ramadan hospitality right on the pavement of the city. After joining the breaking of the fast, we are taken to a few other spots and given top tips on where to find amazing food by the ultra-knowledgeable Ahmad. She leads us to another one of her finds — an Afghan restaurant — for our first proper meal since the start of the tour. The group and I are tired and sweaty but triumphant as we sit crossed legged in Kabul Darbar. The food comes and it is glorious — steaming hot mandu (mutton dumplings covered in yogurt sauce), fiery shammi kebabs, barbecued chunks of mutton and legs of chicken that are crusted with spices on the outside and soft on the inside. We all dig in with our fingers and share stories with each other, forgetting that we didn’t know each other just a few hours ago. It’s the perfect way to end what we started — an exercise in understanding what Ramadan means to the millions of people who observe it in the country. It also exposed us to a side of the city that often gets forgotten amidst the skyscrapers and highways. 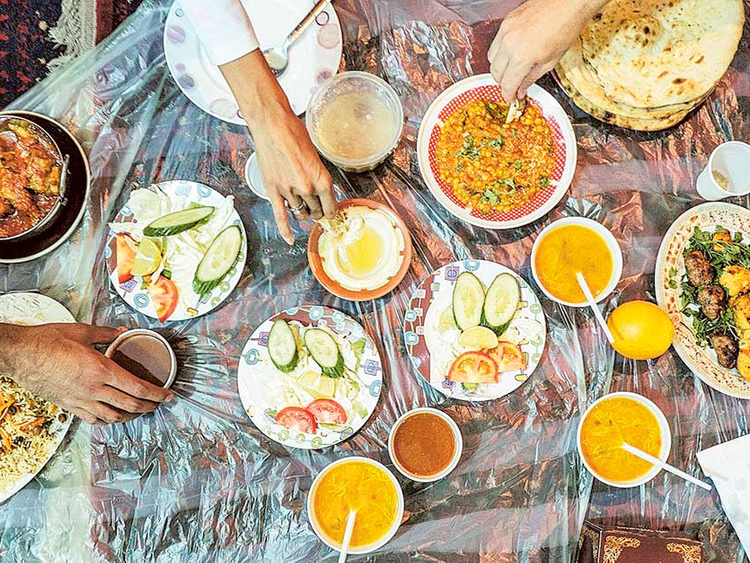 What my group members and I found out was that Deira is a place filled with soul and some of the nicest people — it’s also where some of the best food is hiding. Location: Starting point at Al Ras metro station, Deira. Note: The tour involves a lot of walking in the Dubai heat. Public consumption of food or water will not be allowed until iftar. Driving to the location is not recommended.